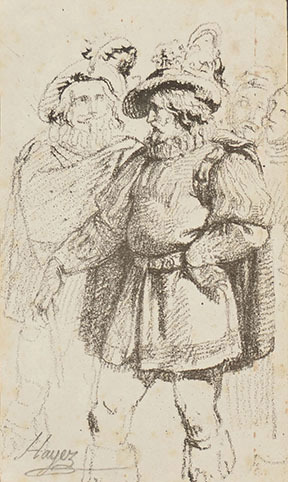 Transfer lithograph, printed in black on white wove, signed in black chalk lower left Hayez. 172 x 102 mm. 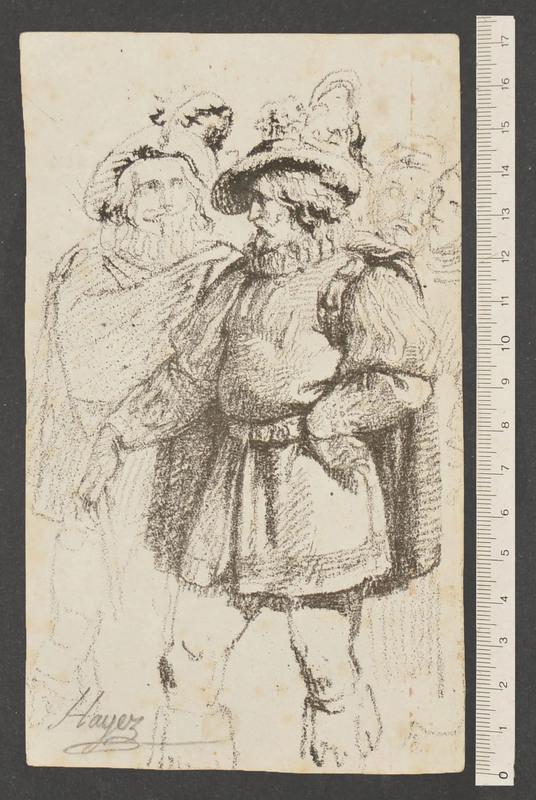 An artist's proof, the second impression known to me, of one of the first lithographs privately created by Hayez in the early 20s, after his arrival in Milan, when he, who was already an accomplished engraver, began experimenting with the new technique. It should be noted that the first patent in Italy for the commercial exploitation of lithography was issued in Milan in 1807. Hayez's activity as a lithographer has been systematically developed for a decade: from the early 1820s to the early 1830s. In the first period Hayez undertakes a personal search to master the technique, which entailed making lithographic proofs not intended for trade, to some degree influenced by those who already practiced lithography in Milan, such as Giuseppe Longhi. These early lithographic essays, often created with the help of the transfer paper, show a simple style in which the artist expresses himself in total freedom, as he would have done in a sketch designed for personal purposes. 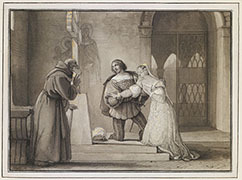 As Calabi stated, the lithographs of this Hayez's first period are in the tradition of the capricci etched by the Italian masters of the seventeenth and eighteenth centuries. 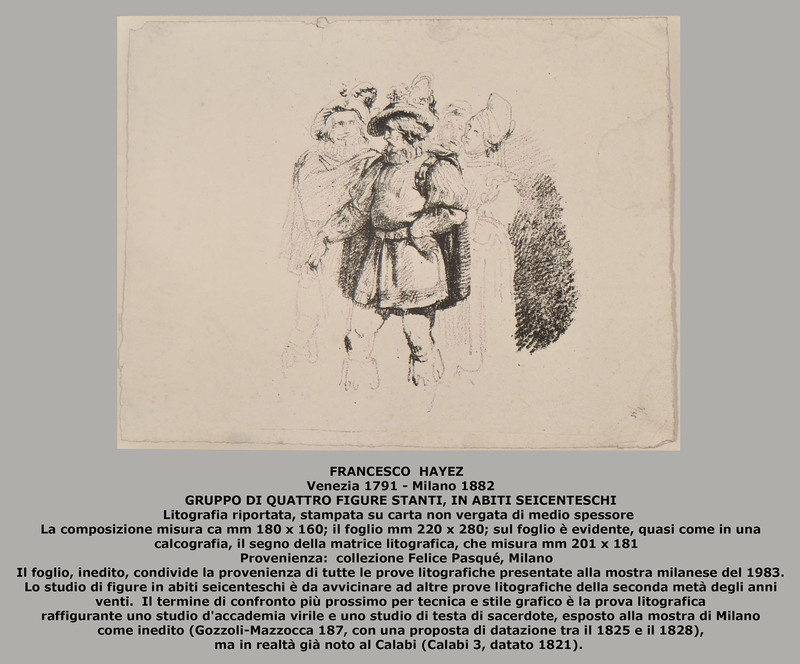 These early lithographic proofs are obviously very rare: a few were identified by Calabi in 1958, others were identified and published at the major exhibition dedicated to Hayez, in Milan, in 1983. A few others have been identified by me and exhibited in my shop in 1990. On that occasion I presented another impression of the present lithograph, full sheet with traces of the lithographic stone, but unsigned. 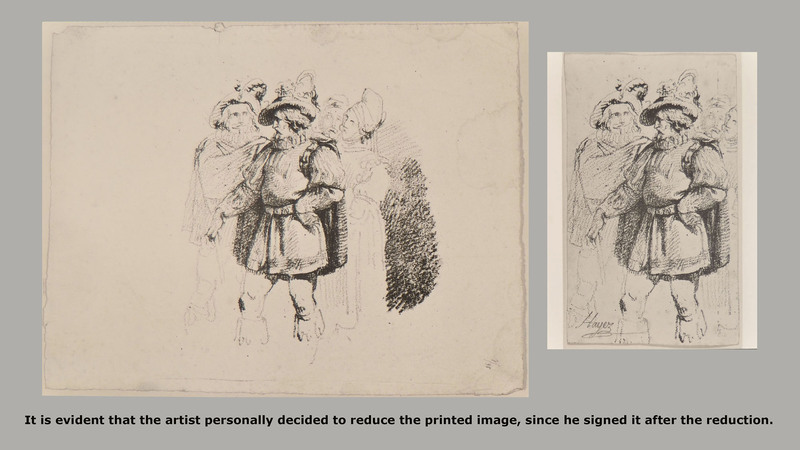 Comparing the images of both the impressions it is evident that the artist personally decided to reduce the printed image, since he signed it after the reduction. 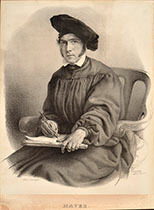 Towards the end of the 1820s Hayez acquired full mastery of the lithographic technique. As he became the acclaimed painter of historical and literary subjects, his lithographic style acquired a wealth of tonal values, and was able to organize extremely complex scenes, on large formats: he was now accepted as the great interpreter of historical subjects matter, even by means of the lithographs. See for example the self-portrait which I present here. PROVENANCE: Francesco Valaperta (1836-1908), the painter who was a pupil of Hayez at the Brera; Paul Nicholls. Augusto Calabi, Saggio sulla litografia. La prima produzione italiana in rapporto a quella di altri paesi sino al 1840, Milan, 1958. Maria Cristina Gozzoli, Fernando Mazzocca, Hayez, exhibition catalogue, Milan, 1983. Mattia Jona, Hayez litografo, la serie dell'Ivanhoe e altre prove litografiche, exhibition catalogue, Milan, 1990.